The main goal of speech language pathology is to improve communication. When it comes to working with children, a speech language pathologist’s primary goal is to make sure your child can understand and be understood in the wider world. Is your child’s speech clear? Does she understand others? When she tells a story about her day, do others understand her? Do her reading and writing skills compare to her classmates’ skills? Learning to speak, to use language and to read are an important parts of a child’s development. Let’s take a closer look at each. Speech refers to the sounds that someone is able to produce. Language refers the ability to understand what others are saying and the ability to put words together to communicate ideas. Reading refers to the ability to decode text, process it and understand its meaning. Articulation disorders: difficulties producing sounds in words which range from mild distortions to complex errors incorrectly to the point that that make it difficult for listeners to understand what’s being said..
Fluency disorders: problems such as stuttering, in which the flow of speech is interrupted by abnormal stoppages, whole and partial-word repetitions (“b-b-boy”), or prolonging sounds and syllables (sssssnake). Resonance or voice disorders: problems with the pitch, volume, or quality of the voice that may distract listeners from what’s being said. In some cases, these types of disorders may also cause pain or discomfort for a child when speaking. Cognitive-communication disorders: difficulty with communication skills that involve memory, attention, perception, organization, self‑regulation, and problem solving. More than 30 years ago, reading problems were thought to stem from deficits in visual perception. Researchers now acknowledge that reading is a language-based skill and the reading difficulties are related to language problems. The ability to read and write is an important communication skills, just as speech and language are. A child who struggles with speech and language is likely to experience reading difficulties as well. Articulation problems can lead to problems with learning to sound out words in text. A delay in receptive language or a limited vocabulary may inhibit comprehension of what is being read. A child with language difficulties is likely to struggle more, and become more frustrated, as reading material becomes more complex. Reading ability is a key factor in a child’s success at school. In general, children in kindergarten to grade 3 are learning to read, after grade 3 students begin reading to learn. The help of a speech-language pathologist to address concerns with speech and language might help to prevent or alleviate potential future problems with literacy, allowing the child to reach his full academic potential. 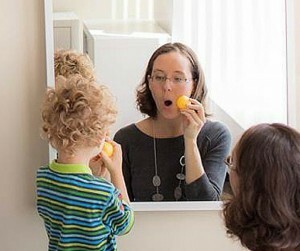 Speech-language pathologists work with diagnostic and educational evaluation teams to provide comprehensive speech and language assessments for children.